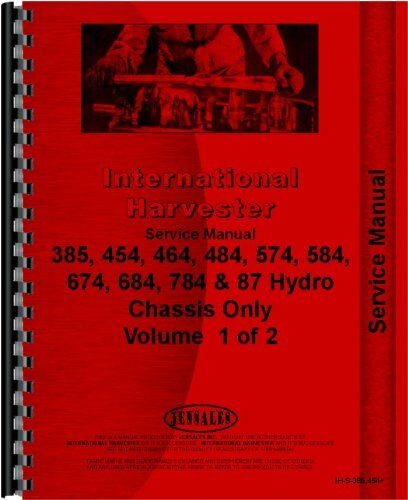 This International Harvester model 464 Tractor Service Manual (Chassis Only) is a digitally enhanced reproduction of the original manufacturer-issued Shop Manual. This manual covers 1973-1978. It contains 576 pages of useful technical information and instruction for your Tractor. Written in the language of a mechanic, it was initially sent to the dealer's service department to provide enough detail for major repairs and complete overhauls. It discusses how to correctly disassemble your 464, fix it, and reassemble it. This is an indispensable tool if you are in the middle of or planning comprehensive repairs or a full restoration. Even if you already own an original Service Manual that's in good shape, you will find our value-added content, such as post-publishing updates, corrections, serial number info and additional machine detail extremely useful. If you have any questions about this product by International Harvester, contact us by completing and submitting the form below. If you are looking for a specif part number, please include it with your message.